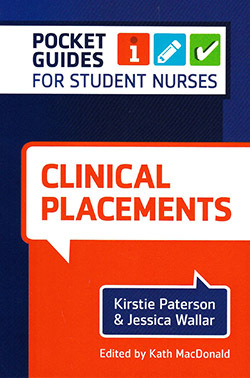 This useful pocket guide to clinical placements is suitable for nursing students just embarking on their careers. It contains numerous hints and tips designed to take the stress out of placements, with areas covered including getting to the placement, settling in, being there and moving on. Information ranges from person-centred care and the Nursing and Midwifery Council code of conduct through to induction, working with a mentor, reflection and action planning. The introduction covers the practical aspects of getting to a placement, the uniform and what to take. Chapter three is especially useful, providing information on personal safety, fundamental skills, basic life support, medication administration, pain management and common medical emergencies. Where appropriate the text is supported by colour-coded tables, flow charts and diagrams to improve understanding. It features a list of abbreviations and terminology, and guides the student on further reading. Written by nurses as a support tool for the next generation, this book is part of a series that includes titles focusing on emergency departments, intensive care, palliative care and mental health. The guidance is mainly applicable to the early stages of a placement, until confidence and competence has been gained.